These veggie rolls are not your average assortment of greens, I’ll tell ya that. This recipe is probably one of the best disguises one could have for eating vegetables. I mean, it’s no secret, the majority of this recipe is veggies, but you’ll never believe how tasty these become when you do them right. I learned about these veggie rolls a few years back from a friend who blew my mind when she showed them to me. We were having a girls night dinner and as an appetizer, she whipped out these funny translucent circles and started soaking them in water one at a time. I basically sat there, sipping on wine, and watching these creations come to life. Once I tried one myself, I was SOLD. So thank you, Rebekah, for teaching me about these colorful morsels of delight. Ya sold a winner right into my mouth! Can you say that on here? Don’t care! It’s my blog! They’re like the healthy person’s corn dogs…or…pigs in a blanket (weird metaphor name)….but 10000x better (and better for you). You can mix and match various sauces with them and basically fill them up with whatever you want. It’s easy and it only takes 3 main steps. Place veggies, roll, dip, and enjoy! Slice any veggies you’d like into matchstick sized pieces. This can be carrots, zucchini/courgette, cabbage, peppers, cucumbers, spring onion, beetroot, anything! If you have access to fresh avocados, add slices of them to the spread, too! Take a plate with a bit of depth to it, a wide bowl, or even a frying pan, and fill it up with at least 1/2 inch of water. Take one rice paper sheet and lay it in the water for approximately 1-2 minutes. Once the whole rice paper sheet has become soft (you can tell by touching it in a few different spots), pull it out of the water. 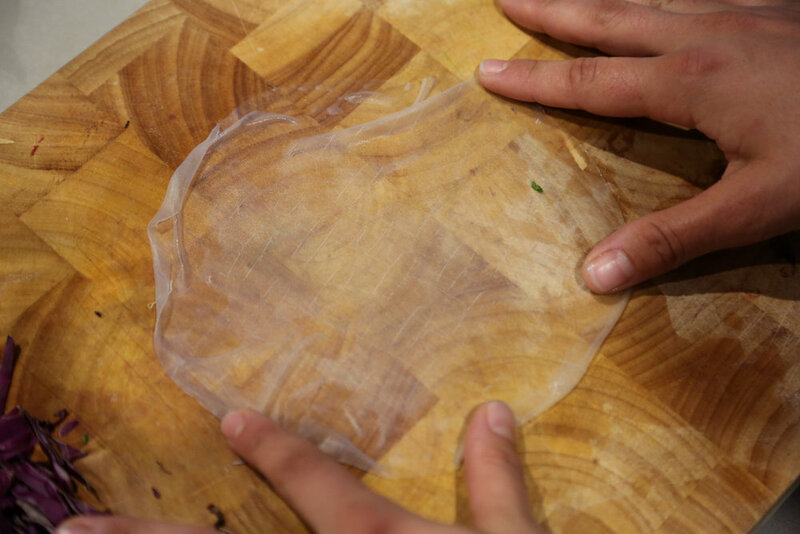 Using your pointer and index fingers, run the rice paper through your fingers to get off any excess water. Lay the rice paper on a flat surface or clean, dry plate trying to get out most creases. It doesn’t have to be perfect, just lay it out like a tortilla. Place 4-6 sticks of each type of veggie in the center of the rice paper all in the same direction. Top the veggie sticks with a bit of mung bean sprouts, avocado, and/or alfalfa sprouts ensuring that there is a veggie pile small enough to be wrapped around and large enough it’ll be enjoyable. Basically, you don’t want too many veggies in there or you’ll just rip through the rice paper and you don’t want too little or you’ll just get a mouthful of rice paper. 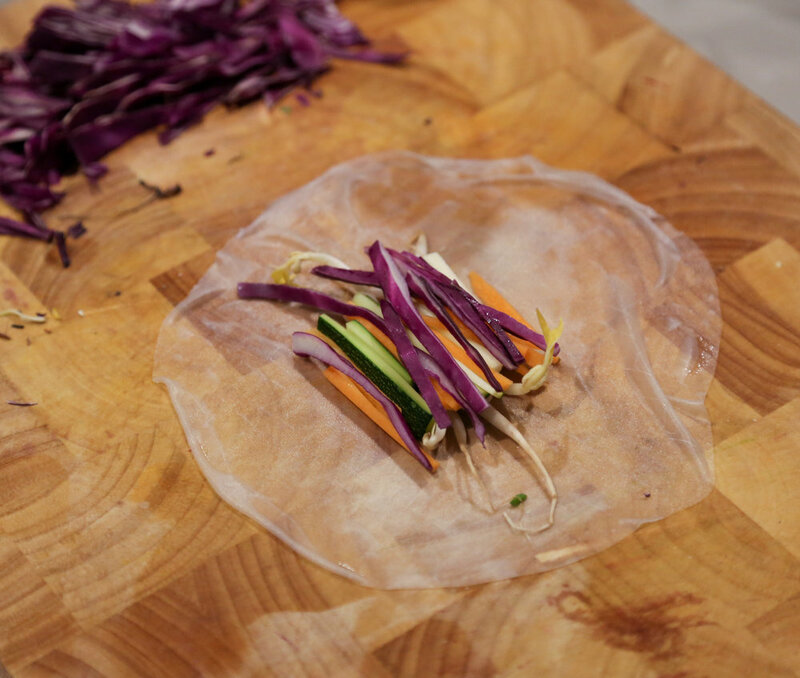 Once your perfectly crafted pile of veggies is ready, take one “side” of the round rice paper from the short ends of where the veggies are laid - not the long end. Fold it over the end of the veggies. Do the same thing with the other side. Take the long “end” of the paper and place it over the whole pile of veggies and folded in sides. This should allow you to continue rolling the paper to the end with each end tucked in. Ta da! You should have a raw vegan vegetable roll! Now, repeat until your veggies are all gone (or you get tired and just want to eat). Okay, let’s debrief on that one. Do you feel like a mad scientist doing surgery on something as you’re rolling those rolls? It can be quite the art and take some care and concentration. Here are some photos that may help you roll this baby veggie burrito so it’s not just a mess on your counter — ha! If it is, I love you for it. 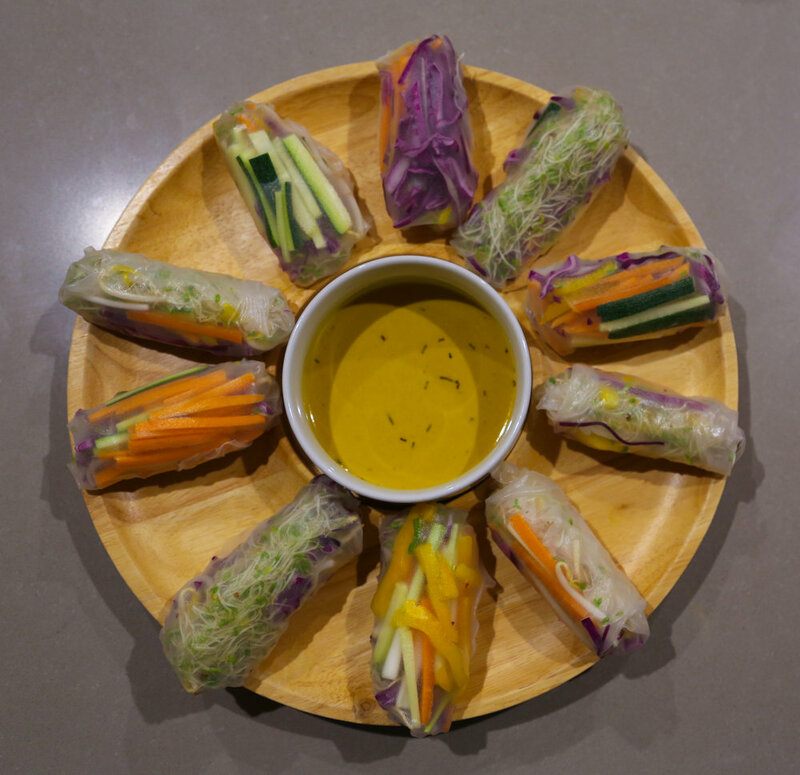 If some veggies fall out or pierce through as you’re rolling the rice paper, don’t worry! Just take it with caution and keep practicing. Once your veggie rolls are all ready, dip them in any of your favorite sauces. These rolls are really healthy on their own, but once you add that salty soy, you know it starts balancing the scales. Do what you like and enjoy your version of these rolls however you’d like! Let me know in the comments below what type of sauce you’ve decided to dip these bite-sized delights in!